Buying a full-size luxury sedan can often be pretty pricey, but with Hyundai's latest 2014 Equus model, cost is no longer an issue! Affordable and stylish, the newly redesigned Equus features a classy exterior with an updated bumper fascia, new taillamp graphics, standard fog lights and a fresh 19-inch silver wheel design. Its interior has also received style revisions, along with a new collection of available amenities. In addition to these changes, five advanced safety features have joined the lineup and the sedan's suspension has been modified to improve handling and ride quality. Continue reading to learn more info about the 2014 Hyundai Equus in Arlington, then scroll down for details on its specifications. For 2014, the Hyundai Equus has received significant upgrades to its interior, giving it a more fluid look that Arlington buyers will enjoy. The instrument panel and center stack have been redesigned and outfitted with new user-friendly button symbols, while the rear of the vehicle has been equipped with a new rear console, available with a 9.2-inch video display. Additionally, the center console and shift lever have been updated with high-quality materials, while ivory leather finishes/wood trim have been added throughout the cabin, providing extra luxury. A slew of new technology components, including smart cruise control, smart key, climate control, power door closure and three LCD displays, also infiltrate the Equus for 2014, finishing of its interior offerings. 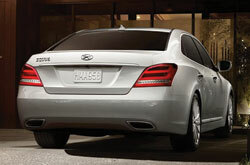 Fueling the Equus is a 5.0L V-8 engine exerting 429 horsepower and 376 lb.-ft. of torque. It's paired with an eight-speed automatic transmission and works along the sedan's newly-revised suspension to achieve fantastic handling and a smooth ride quality - noted in many 2014 Hyundai Equus reviews. Changes to the suspension include crisper damper tuning on the sport mode, enhanced ride comfort of the normal mode, a new snow mode and improved front suspension bushings. Aside from mechanical modifications, the Equus also introduces Assurance Connected Care, rear-cross traffic alert, blind spot detection, a heads-up display and a multi-view camera to its list of safety features for increased in-car security. Is the Hyundai Right for You? 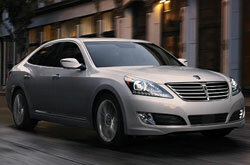 We're sure that the Equus is an ideal fit for you. 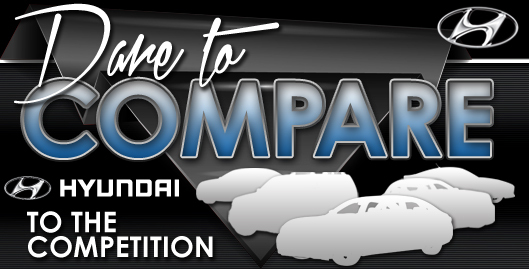 That's why we offer tools that will allow you to compare Hyundai's latest model alongside the 2014 BMW 5 Series, Infiniti M Series, Mercedes Benz E Class and the Acura RL. If the Equus's competitive pricing and passenger-oriented cabin features don't persuade you that it's the perfect vehicle for your needs, we're sure its exquisite looks will seal the deal. You'll easily see that when compared to the competition it's a phenomenal value in regard to price, which is why many Arlington Hyundai customers choose it. 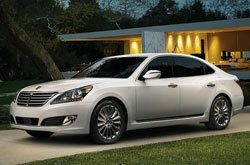 For more information about what it offers, check out the Equus's quick-facts list under this paragraph. If you're having difficulty deciding which Hyundai is right for you, please read the Equus review above, along with reviews of other current 2014 models sold at Vandergriff Hyundai. Not all car dealers in Arlington are the same. We feel it's our duty to furnish customers with quality vehicle reviews; this sets us apart from the typical dealer. Everything perspective car buyers need to make good decisions is right here, including info regarding powertrain options and other specs. Each paragraph is bundled with important facts and specs - all at your fingertips. Now that you've read Vandergriff Hyundai's review of the 2014 Equus, please call us to find out about OEM incentives and finance offers, so you can save significantly on your next purchase!